You’re against a tight deadline on the postcard advertising your companies annual meeting at a resort hotel in Charleston, SC. You have the copy and other information, you just need a great image to put on the front that grabs the attention of the person receiving the postcard. A quick Google search returns hundreds of perfect images you want to use. But can you legally use an image found through Google? It depends. Google does allow you to search for images labeled for reuse with modification which means that you can use that image commercially or non commercially. But if you happen to use an image not labeled for reuse, you could face some hefty fines. Before we get into copyright and the laws that protect your work, any information in this article is to help you understand some of the issues of copyright protection. Always consult a copyright attorney to see if you are in violation of copyright laws. So how do copyright laws protect property rights and how do they affect the print industry? If you take a photo, design something, or crate any other work of art and want to profit from it, you would want it to be protected so that no one else could use it unless they paid you. Copyright laws protect your work. In order for your work to be able to have a copyright, it must be an original piece and exist in physical form. Once your piece is published, copyright comes into effect immediately. Today you do not need a copyright notice, a ruling in 1989 removed the need, but it is still good to have if you want to protect your work. The time limit for the copyright to your work is the duration of the author’s life plus 70 years after the author’s death. In the US, anything published before 1923 is public domain, meaning the copyright has expired. What images can I use in my designs? Any work that is under public domain is available for you to use. Although these images and works of art are almost 100 years old you’ll have a tough time finding a good image that fits your design. This act, introduced in February of 2017, allows people to use copyrighted materials in a limited area. The FAIR Use Act (Freedom and Innovation Revitalizing United States Entrepreneurship Act of 2007) was created to "promote innovation, to encourage the introduction of new technology, to enhance library preservation efforts, and to protect the fair use rights of consumers, and for other purposes." Now there is a lot of wiggle room in determining what are “fair circumstances” and using someone’s photo of Charleston to promote your company meeting might not fall under a fair circumstance. Does reproducing the work, or the use of the work devalue the original piece? The photo we used is only showing the beauty of the city the meeting is taking place in and is not being used to sell anything, so it may not devalue the original piece. How the copyrighted material is used. Are you profiting from the use of the material? If so, then you probably can not use that material. But, if it is for educational purposes, it may be possible to use. The amount of the copyrighted material used. Are you using the entire photo, or just a piece of it? Maybe the image you want to use shows a beautiful sunrise over the Arthur Ravenel Jr bridge but you only want to capture the sun and one of the pillars of the bridge. It is possible that you could use the image. Unfortunately, there is no clear cut instructions on how to use copyrighted material. If you use an image that is very popular or easy to recognize the creator, you could be hit with a fine. The best and easiest way to stay legal is to either take the photo yourself, or contact the creator and get permission or purchase the image. Copyright laws for photos and other works are very complex and may be hard to understand for some people. When in doubt, choose another image or work of art. Copyright laws and reproducing U.S. currency images. Since the Counterfeit Detection Law of 1992, reprinting U.S. currency in color has been allowed but the U.S. government is very strict on their use and you must adhere to their counterfeiting-protection rules in order to stay legal. If you intend to reproduce an image of U.S. currency, the image must be smaller than ¾ the original size or larger than 1 ½ times the length. Coins are ok to use in your print material, but, you can not create tokens or other metal discs that even closely resemble U.S. currency. Two sided reproductions of U.S. currency is strictly prohibited. If your design has the look of currency, it has to adhere to the size regulations above, and can only resemble the currency on one side. The other side must have copy or a different look to it. If you create any replication of U.S. currency, again you must stick to the size and one sided guidelines above, any plates or digital images must be destroyed after final use. If you need to reproduce your piece after the first printing, you will have to redesign the image that used the currency look again. 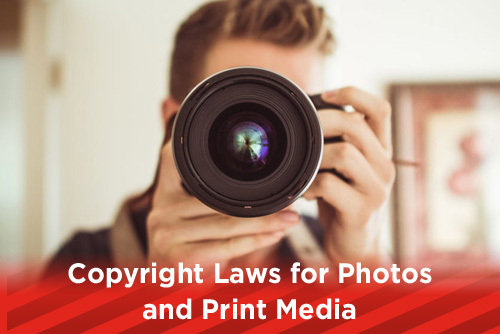 The digital age has made it very easy for people to misuse material that has been copyrighted, but if you are careful and research the images you are using, you can stay legal and have great images and graphics. Using some of the many free image websites, like pexels.com, that offer images that can be used in both commercial and non commercial instances, can provide a professional look to your designs. Another option is to use local talent to capture the perfect image you are looking for. Whatever option you use, keep designing and creating awesome graphics!